Building Description: This air conditioned apartment is on the third floor of an 18th century building that unfortunately does not have a lift; once you will enter the apartment you will understand immediately that it is worthwhile to climb the 3 floors!The living room is modern and stylish and develops on two different levels. On the lower level, there is a comfortable sofa, a coffee table in front of it, a Sat TV, Internet access and a library.A large dining table with chairs is provided. A modern and design staircase will lead you to the upper level where you will find a desirable studio with a writing desk and a couch that turns into a double sofa bed.The kitchen is all the rage and fully equipped: gas stove, oven, fridge, freezer, dish washer and washing machine.The master bedroom is bright and spacious, featuring a king size bed, night tables, abat-jour and wardrobe. The en suite bathroom has a shower. Location: This is a perfect starting point for discovering the city! You cannot miss the visit of the famous Piazza di Santa Cecilia, especially by night when it is illuminated by many torches. We also recommend you to have a dinner at “Ristorante la Gensola“, just nearby. 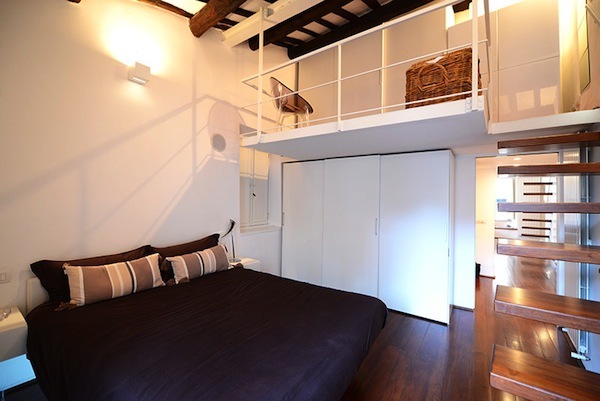 If you`re looking to live in Rome for an extended period of time, we suggest you to stay at Trastevere Stylish Loft for a comfortable stay. Move and Stay allows you to book easily a Rome apartment, whether you`re looking for a serviced apartment, an aparthotel, or a residential apartment for rent. Many of our Rome serviced apartments come with full accommodations, including a full kitchen and a lounge. In order to provide the most convenient service, Move and Stay helps you find trastevere, rome apartments for rent with our easy-to-use apartment locator. Simply fill in the required information and search for your trastevere, rome apartment.